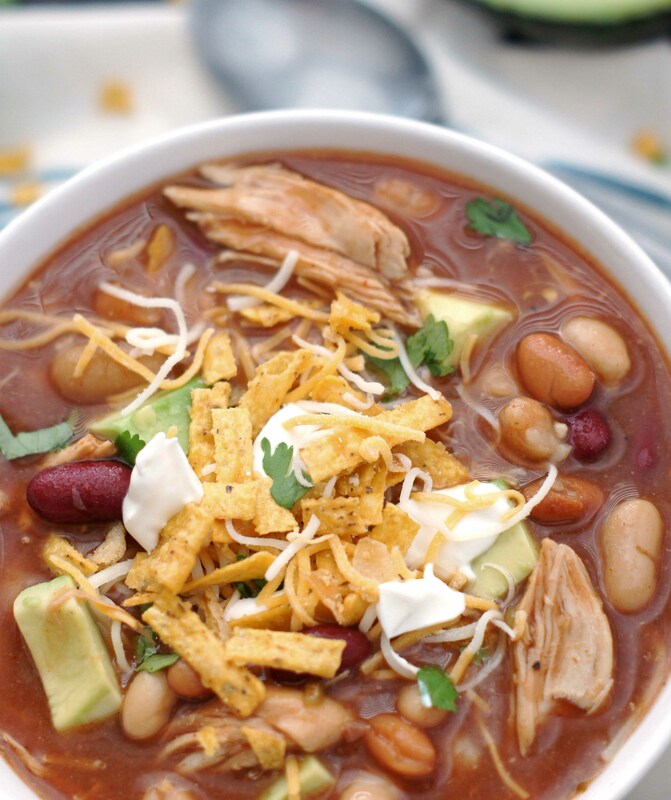 This Slow Cooker Sweet and Smoky BBQ Chicken Chili is so good and incredibly simple to make. You are going fall in love with this chili. It’s November which usually in Utah means cold temps and most likely snow. Well, we have no snow and it’s still in the mid to upper 60s. I’m not complaining, I am loving this weather, but soups and chilis are my favorite things to make this time of year, and eating a bowl of soup or chili for dinner when it’s 65 degrees outside just isn’t quite as warm and comforting. Clearly I’m not letting that bother me though. I have been so excited to share this recipe with you. 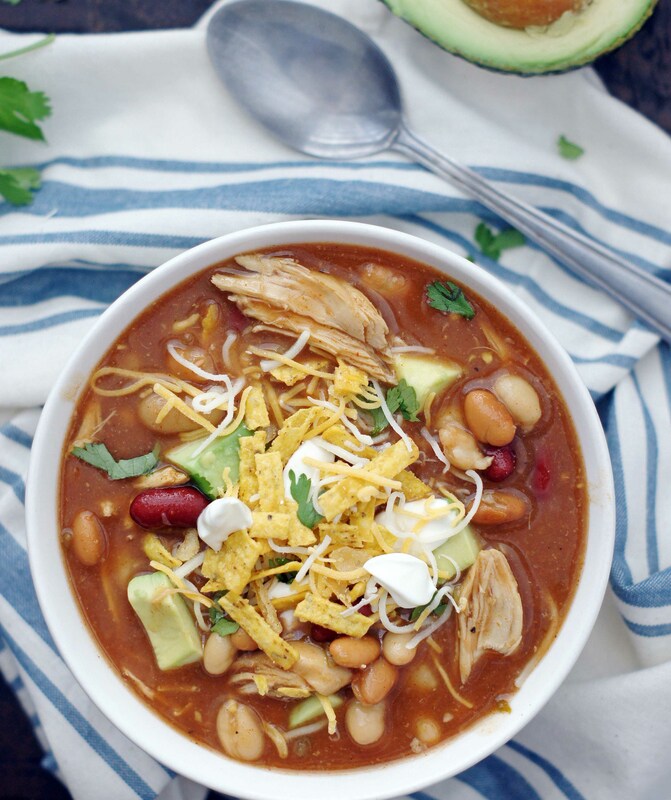 This Slow Cooker Sweet & Smoky BBQ Chicken Chili completely blew us all away the other night. We ate every last drop. Braydon informed me he could eat it every night and not get sick of it. Now coming from Braydon you have no idea how HUGE that is because he is so, so picky! I have to completely agree with him, I too could eat this every night. I actually made it two nights in a row because I didn’t get any photos the first night. I didn’t have a single complaint when my boys sat down to eat it a second night in a row. This is one of the easiest slow cooker recipes you’ll ever make, There’s no browning or sautéing before hand. It’s just one of those dump and walk away recipes. The smoky flavor paired with the sweet it spot on. The flavor is out of this world. It’s a nice change from your traditional ground beef chili and/or white chicken chili. Make sure you use smoked paprika, and if you’re not familiar with liquid smoke it’s usually found down the condiments aisle next to the BBQ sauces. 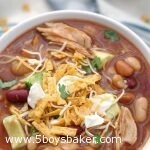 It’s really inexpensive and is definitely a star ingredient in this chili. Please just promise me you’ll try this. You will be so happy you did. Place chicken breasts in the bottom of your slow cooker drizzle with olive oil. Add all of the remaining ingredients and stir around chicken. Cook on low 5-6 hours or on high 3-4 hours. When chicken is tender, remove to a plate and shred, return to slow cooker. Cook an additional 20-30 minutes. Add add hot sauce and serve. Garnish with cheese, cilantro, sour cream, and chips. I made this tonight with the cornbread recipe you recently posted, and it was all amazing! Even my 18 month old loved it. Thanks Chelsea! I’m so happy you loved it. It’s become a favorite at our house. Does the chicken need to be defrosted? Thanks! Hi Heather! The chicken can be frozen or defrosted. The last couple weeks have been a 5 boys baker kitchen. I have been making something from your blog every day and today was no different. We had my married kids over for their Anniversary dinner and made this chili and I got 2 thumbs up from both of them. This was SOOOOO GOOD and so simple. I keep thinking there is bound to be something we don’t necessarily care for, but so far EVERYTHING I have made has been a hit. Yippee!!! Thanks Shelly! I love getting comments so thanks for taking the time to leave them. Glad I can help make you look amazing in the kitchen (lol!). What size crockpot.. how many servings in this recipe? I use my 6 quart slow cooker. This easily serves 8-10. I hope you love it.